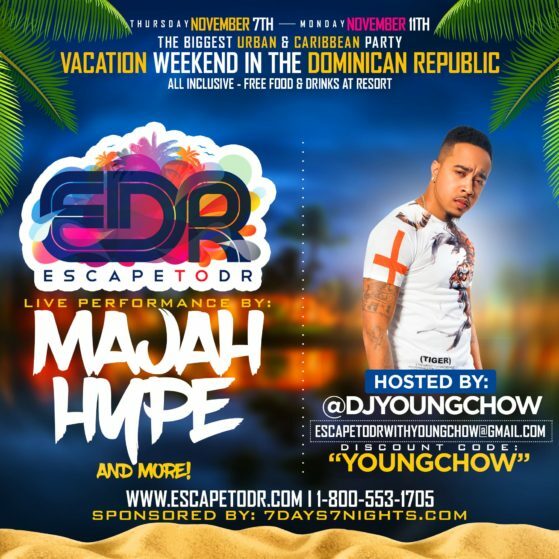 Escape to the Dominican Republic is a Mega Party Weekend brought to you by the top promotional company City Elite Group, NYC Compton & Hot 97’s DJ Young Chow. EDR is a unique Urban & Caribbean Vacation that gives individuals an affordable first-class experience of premier nightlife and unforgettable excursions in the Dominican Republic. In the last 2 years, over 1000 vacationers from around the globe descended upon the Dominican Republic to party with mega superstars like FABOLOUS & CARDI B, YO GOTTI, and POPCAAN. The Young Chow brand is more than your ordinary entertainer or DJ: It’s a fashion enthusiast, an entrepreneur, a Baron Tequila Brand Ambassador, and more! For Young Chow, DJing isn’t a hobby; it’s a lifestyle that he was born into. Young Chow’s goal as a DJ was always to be on HOT 97, and now you can tune in to him as he brings the same energy that he showcases in the clubs straight to your radio!